MET League of Colleges held the MET Annual Convocation 2010 on September 4, 2010. The ceremony was presided over by the Chief Guest Mr. Kishor A Chaukar, MD - TATA Industries Ltd. Other dignitaries present were Mr. T R Doongaji, Former MD - Tatasons, and Pankaj Bhujbal, Trustee - MET. 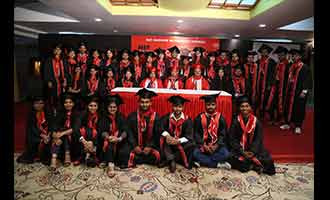 Students from the Management, Mass Media, Insurance and PGDM e-business programmes were felicitated at this grand prestigious occasion.